Bangalore: As it recovers from the setback in Rajasthan and inability to wrest Delhi, the Bharatiya Janata Party (BJP) is facing critical by-elections in Karnataka on 27 December that could potentially decide the fate of its six-month-old government in the southern state. The by-elections, in eight constituencies, means the BJP needs to win at least three to get a simple majority of 113 seats in the state’s 224-member legislative assembly. The government relies on support from six independent candidates. Four of the defectors are ministers in the B.S. Yeddyurappa cabinet, while three have been appointed to the boards of state-run entities such as the transport corporation, slum clearance board and small industries development corporation—moves that have also caused some angst among BJP loyalists. The BJP’s state president D.V. Sadananda Gowda predicts the new BJP candidates will win saying: “Development will be one of the important (election) issues." Following its wins in Delhi, Rajasthan and Mizoram on Monday, the Congress party has become bullish about its own prospects here. “This is a morale booster for our workers in the state. 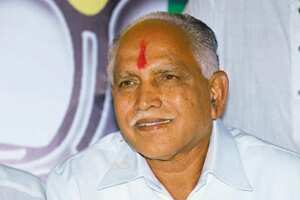 BJP has been taught a good lesson," said R.V. Deshpande, Karnataka Pradesh Congress Committee president. Deshpande also ruled out any alliance with the JD(S), a party led by former prime minister H.D. Deve Gowda. “We are contesting all eight seats. We don’t have any understanding with JD(S)," he insisted. Y.S.V. Datta, JD(S) spokesman predicts his party will win five seats out of the eight, adding: “For us, it’s a question of our survival." In Madhugiri, the JD(S) has chosen Anita Kumaraswamy, Gowda’s daughter-in-law, as its candidate. She is wife of H.D. Kumaraswamy, former Karnataka chief minister who was elected the party’s state president last month.